We had taken some fish out of the freezer for dinner, so this obviously needed to be used pizza or no pizza. I sprinkled the fillets with seasoning and fenugreek and pan fried until just done, then flaked it into a bowl. We also had about eight small potatoes leftover from our most recent Sunday roast, so I threw those in a saucepan and boiled them until tender and then mashed. Can you see where I’m going with this? If you’re American, you might not immediately figure it out. Until I moved to the UK I had never witnessed a fishcake which was filled with more potato than fish. In fact, I had never had a fishcake which had any potato in it at all. 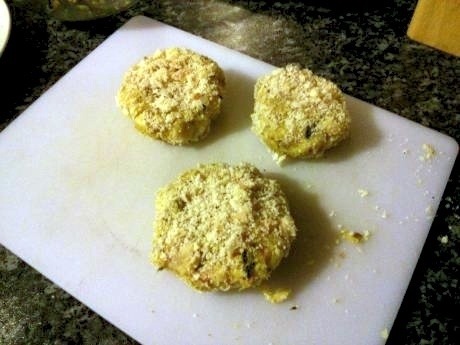 To my mind, a fishcake was large pieces of fish held together by egg and the minimum amount of breadcrumbs necessary to form them into cakes. Not so across the pond. I have wholeheartedly railed against these types of Britcakes believing that they sully the very ingredient the people of these isles hold up so proudly – anything buried in mashed potato isn’t going to taste of much else. However, on this occasion I didn’t have enough fish to make one decent cake, let alone enough for two lunches, and I did have the leftover potatoes…so…I caved. I will not claim that the fish was moist and delicious and that it’s flavors sung despite the potato. It didn’t. If I hadn’t made them myself, I wouldn’t even have known it was there. However, this does not mean they weren’t tasty. I threw in diced red onion, red chilli, mint, cilantro, curry powder, garam masala, turmeric. Boom, boom, boom. I, sparingly, tossed the formed cakes in breadcrumbs (home made and then frozen, a good freezer should never be without them!) and fried until golden. Then, for moisture and freshness, I threw some chopped mint into some low fat natural yogurt and drizzled that over the top of the fried cakes and served with a small spinach salad. So ultimately my attempt not to cook resulted in spending about 45 minutes in the kitchen and coming out smelling like a curry house, but all in all a delicious, satisfying lunch even if I did throw my culinary morals under the bus to do it. Yum. I really like the sound of these potato and fish cakes. Thanks, they were pretty tasty. Probably taste just as good without the fish though! I agree british fishcakes are anything but. 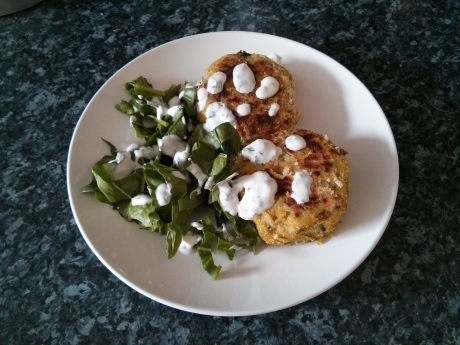 I tried making man v food crab cakes – they were amazing and not a breadcrumb in sight! Are they on your blog? I’ll have to look them up. I definitely wouldn’t give up on real fishcakes without potato, but they are tasty. 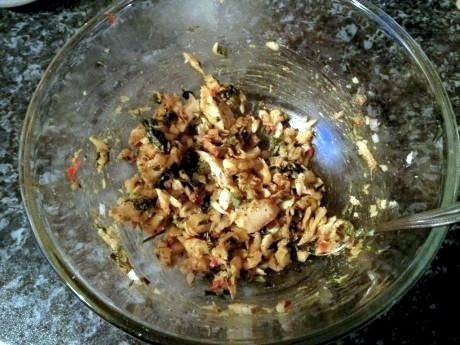 You probably need a greater ratio of fish to potato otherwise you won’t know the fish is there. Thanks, Nick. And for the record, those crab cakes I made for you a zillion years ago contained no potato (or seahorse) whatsoever. Lunch was definitely better than pizza.